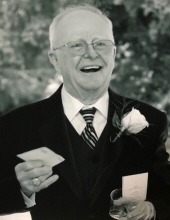 Beloved Robert Thomas Andresen passed away on January 13, 2019. Bob is survived by his loving wife of 63 years, Antoinette. Also, six children: Douglas Andresen (Clare) of Raritan, NJ; Marc Andresen (Kris) of Waverly Township, PA; Celeste Andresen (Jim) of San Manuel, AZ; Jennifer Armstrong (Michael) of Chapel Hill, NC; Karl Andresen (Jeannie) of Raritan, NJ; Matthew Andresen (Loring) of Raritan, NJ; also, two grandchildren: Jacob Andresen (Amanda) of Flanders, NJ, and Sarah Andresen of Raritan, NJ. He is survived by his sister Mary Gorman (Jim) of Middlesex, NJ. Bob was born in Patchogue, Long Island, NY to William and Anna Andresen. His siblings who preceded him in death included Anne Thomas, William Andresen, Jr., Agnes Sechy, Margaret Weeks, and George Andresen. He is a graduate of Somerville High School, then served four years in the U.S. Air Force, serving during the Korean War. Upon his return to the U.S., Bob worked as a researcher for Johns-Manville, Manville, NJ where he was credited with two patents. He moved to a position as a researcher in Ethicon, Bridgewater, NJ until his retirement. Following retirement, Bob worked part-time as a science lab assistant at Bridgewater-Raritan High School. Bob will be remembered with great love for being a steadfast, generous, and loyal husband, father, and grandfather. He was up for any adventure, and enjoyed extensive travel with his family--from Mount Saint Helen’s to Mount Etna. In September 2018, Bob fulfilled a life-long dream of flying in a P-51 (vintage fighter plane). Bob loved the sea, boating, fishing, biking, and hiking. He was always smiling, and had a wonderful, wry, and sometimes impatient sense of humor. He loved learning, valued information, and read during any spare moment, choosing a good book or magazine over television. He studied his genealogy and enjoyed writing about his family history. His family is blessed with fond memories filled with love, laughter, and the joy of Bob having been with them. His love continues to shine upon us and guide us. Viewing will be held Wednesday, January 16, 2019 from 4-8pm at the Branchburg Funeral Home 910 US Highway 202 South, Branchburg, NJ 08876. Funeral services will start with a prayer at the funeral home on Thursday, January 17, 2019 at 9:15am followed by a 10:00am funeral liturgy at St. Ann’s R.C. Church in Raritan. To send flowers or a remembrance gift to the family of Robert T. Andresen, please visit our Tribute Store. "Email Address" would like to share the life celebration of Robert T. Andresen. Click on the "link" to go to share a favorite memory or leave a condolence message for the family.